Like no other contemporary political leader, US President Donald Trump has focused global attention on the tensions that emerge when a billionaire, possessing a vast business empire, assumes high political office. But what happens when this vast business empire is largely hidden from the public eye? For over a decade, Peter O’Neill has built a prolific public profile in Papua New Guinea, which has become synonymous with his ascendancy to the peaks of political power. Beyond these political feats, the public is broadly aware O’Neill enjoys sizeable corporate interests – few know, however, the full depth and breadth of his business empire. An in-depth investigation conducted by PNGi has uncovered over 100 different corporate entities, directly or indirectly linked to Peter O’Neill. The most conservative estimates value O’Neill’s business empire at over K250 million. Even then, caution must be exercised. Evidence presented by two commissions of inquiry indicate that O’Neill, and his legal team, use proxy shareholders and trust arrangements, which have the effect of concealing his beneficial interests from public view. 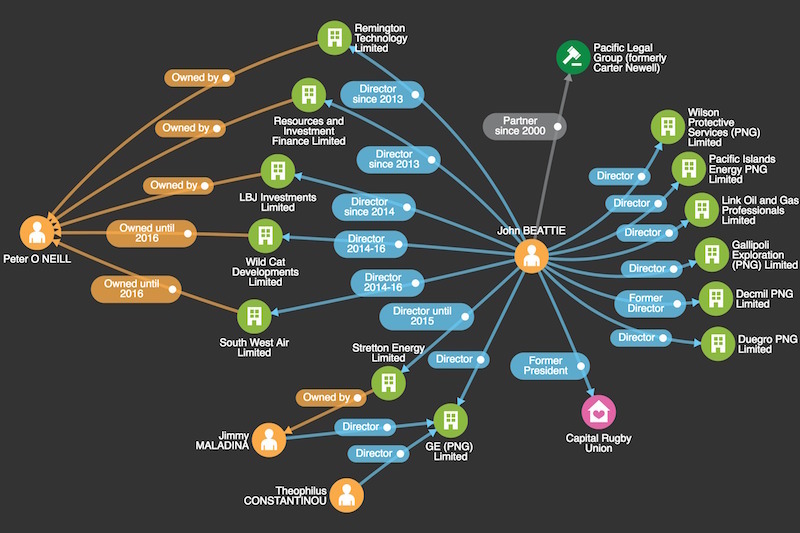 The network map below gives a visual impression of the scale and extent of O’Neill’s corporate connections, which have been uncovered. 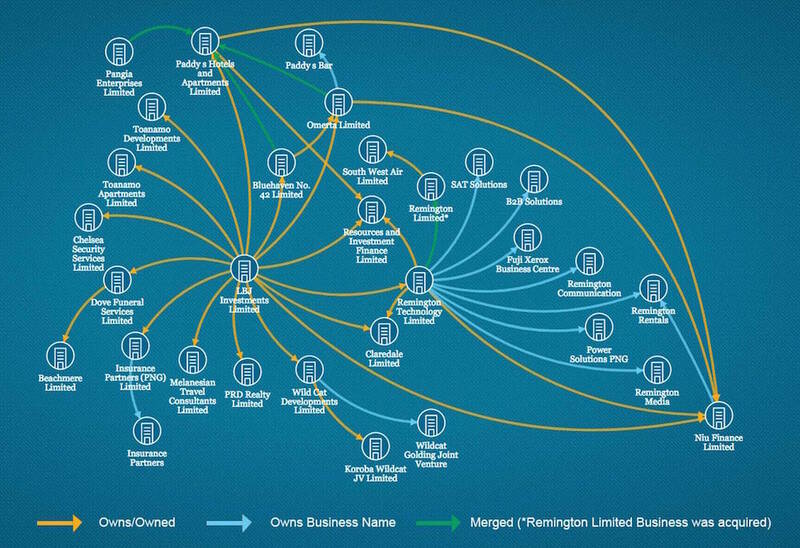 Network Map: Peter O’Neill’s business empire. 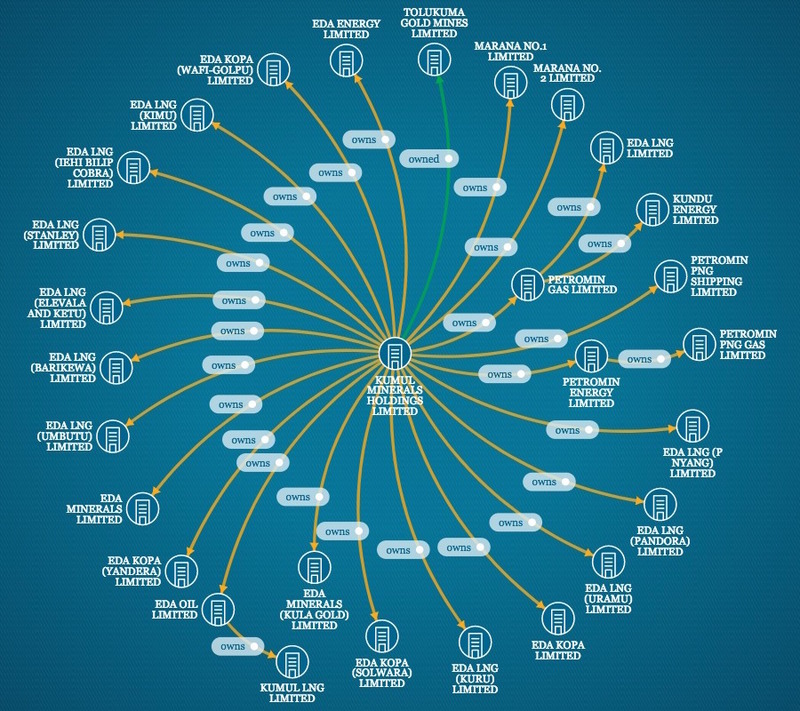 This expansive network of companies, and associated business partners, has put the Prime Minister into situations, where his political position and private interests appear to converge in ways that prompt a range of questions. In the past, some of these questions have been explicitly raised by legal authorities, mandated to oversee commission of inquiries. The answers delivered cast Peter O’Neill as an adept businessman who – in league with a network of close affiliates – has illegally exploited governance weaknesses within state and statutory bodies, to ingratiate his own businesses; nefarious activities which he hides through proxy shareholders. They also portray a man who has benefited from having allies in key positions of public and private power. O’Neill rejects these accusations. And would point to a failed prosecution attempt in 2007. His critics on the other hand, would argue an underfunded and inexperienced prosecution service was simply unable to execute commissions of inquiry findings, produced by well-resources, and far more experienced, judicial authorities, including Tos Barnett and Don Sawong. Managing such a wide range of private interests, while steering government, is a task fraught with complex governance challenges. Set against this backdrop, PNGi’s special investigation aims to illuminate the vast business empire belonging to one of Papua New Guinea’s most successful Prime Ministers. The investigation does not contest the right of politicians to have private interests outside public office. However, it does look to concentrate attention on the complex ethical questions that emerge when these interests are so vast and largely hidden, they become entangled with the exercise of political power. It also questions whether Peter O’Neill has judiciously ensured that his own private empire, and close personal network, conduct their affairs in a way that upholds public respect for the Prime Minister’s office. The first instalment in this investigative series – The Secret Millionaire – takes us inside the O’Neill Empire and reveals for the first time something of the nature and extent of his business interests, his key associates, his brushes with the law and how his private interests may have benefited from political decision making. Act I Getting by with a little help from his friends: O’Neill’s education, first forays into business and how his first political appointments, under Prime Minister Bill Skate, almost led to his downfall. Act II On the rise – the O’Neill empire has a growth spurt: How, post Skate, O’Neill’s business network flourished and then continued to grow after he entered Parliament and served in various Ministerial positions. Act III Having your cake and eating it too! How O’Neill’s businesses have profited from government decision making and the largess of foreign actors during O’Neill’s second and third terms in Parliament as he ascended the heights of political power. Peter O’Neill was born on 13 February 1965, in the Ialibu-Pangia district of the Southern Highlands Province. His father, Brian, was an Australian ‘kiap’ from Melbourne. O’Neill’s mother, Awambo Yari, was a local woman from Pangia. A year later, O’Neill initiated his business career, at the age of 22. Initially, this occurred under the tutelage of another former Australian ‘kiap’, Virgil Counsel, who had arrived in PNG during 1948, a year before Peter O’Neill’s father. Counsel made O’Neill a minority shareholder in Trans PNG Services Pty Ltd in August 1987. Two-years later O’Neill was appointed director and secretary, positions he held until 1996, according to Investment Promotion Authority (IPA) records. In August 1987, O’Neill also became a director and company secretary at Pangia Enterprises Limited. 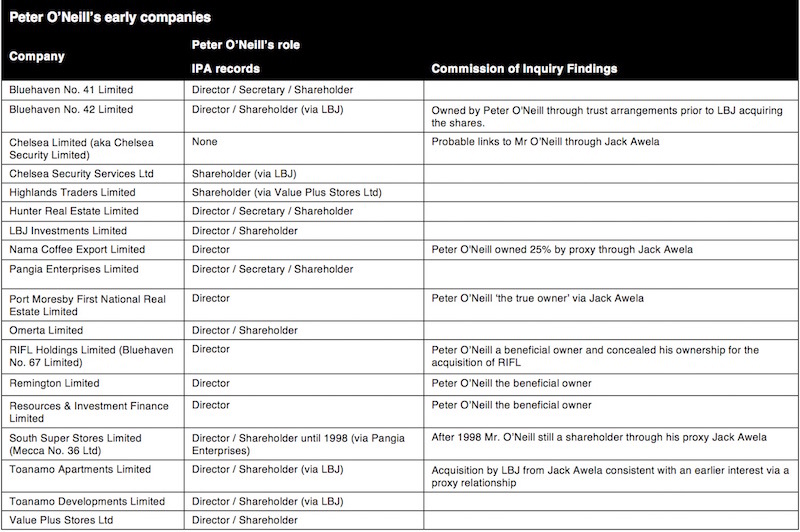 IPA records do not reveal the original shareholders, but by January 1989 Peter O’Neill is listed as a shareholder and in 2009, he acquired sole ownership. In 1996, Oscar Wandi Yamuna joined the company as a director, marking the beginning of a fifteen-year business relationship, according to IPA records. Yamuna is referred to in a 2007 commission of inquiry report as Peter O’Neill’s ‘alleged…first cousin’. O’Neill’s then wife, Cheryl, also joined the company as Director. While the seeds of O’Neill’s future business empire germinated, he cultivated a professional career. During university, O’Neill worked at the international accountancy firm Coopers & Lybrand (now Price Waters Coopers), before joining Maurice Pratley and Associates in 1988. O’Neill qualified as a certified accountant the following year. He then became a partner in Pratley and O’Neill. During 1990, O’Neill was appointed President of the PNG Institute of Certified Accountants. In 1993, Pratley and O’Neill was dissolved. O’Neill began to focus on running his own businesses, splitting his time between Goroka and Port Moresby, with interests in trade stores and real estate. During this period Peter O’Neill forms key business relationships with a number of allies, some of whom will stay with him during his entire business and political career. The evidence from commissions of inquiry suggest this is part of a pattern of behaviour. O’Neill surrounds himself with close friends and family, creating a trusted network of allies spread across public and private positions, which is then leveraged to gain competitive advantages. In 1992, for instance, Peter O’Neill set up, Hunter Real Estate Limited in Port Moresby. He is listed as the company’s director, shareholder and secretary. O’Neill’s close family friend, Maurice Sullivan, acted as Hunter’s General Manager. O’Neill also acquired or set up Mecca No.36 Pty Limited, which in 1998 changed its name to South Super Stores Limited, a wholesaler and retail business in Goroka with an annual turnover of K20 million. 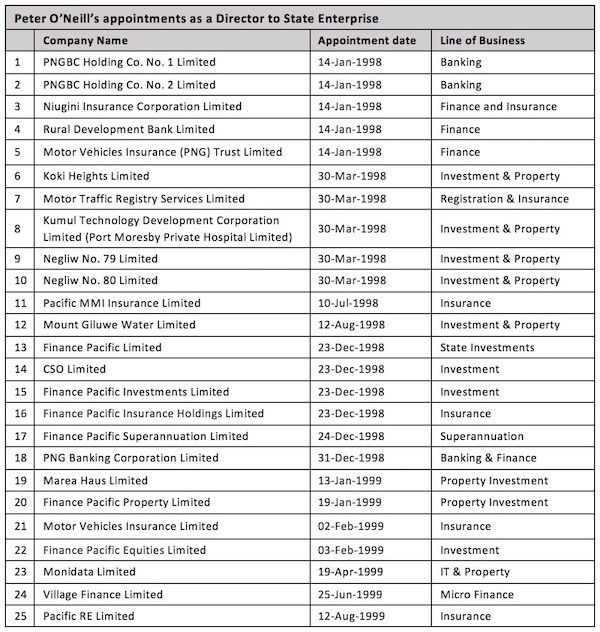 Although the IPA records do not provide a clear picture, in his evidence to the National Provident Fund (NPF) Commission of Inquiry during 2001, O’Neill confirmed that he jointly owned Mecca No.36/South Super Stores Limited, through Pangia Enterprises, along with Nathaniel Poya [see PNGi’s Power Profile for Nathanial Poya]. However, IPA records indicate that in 1998, the Pangia Enterprise’s shares in Mecca were transferred to Jack Awela – O’Neill’s alleged uncle. Although that information was not lodged with the IPA until 2000. If O’Neill’s sworn evidence to the NPF Commission of Inquiry is accurate, and in 2001 he was still owner of South Super Stores Limited, presumably Awela acted as his proxy. This is further supported by related findings of the NPF Commission of Inquiry, which concluded Jack Awela held shares in various companies, including Mecca No.36 and Nama Coffee Exports, as a proxy for Peter O’Neill. O’Neill is also listed in IPA records as a director (1996-1998) and secretary (1996-97) of Mecca (No.36)/ South Super Stores. Through Mecca No.36/ South Super Stores, Peter O’Neill formed a number of enduring business partnerships. One is with Nathaniel Poya, his alleged relative, who joined as a director in 1996 and became a shareholder in 1998. Poya is himself connected to Maurice Sullivan, through the company PNG National Stevedores Limited, which Poya part owns. According to IPA records, both Poya and Sullivan have been directors there since 1994. A second long-standing partnership is with Joseph Bakri Kup, who worked as Mecca No.36’s accountant in 1998 and was the company secretary from January 1997 to May 1998. He then moved on to another alleged O’Neill company, Port Moresby First National Real Estate. Subsequently, Kup acted as an accountant in many of O’Neill’s business ventures. A third key relationship is with Jack Awela, who was just mentioned. According to O’Neill’s account, they were introduced by his long-standing family friend, the Australian manager of Hunter Real Estate, Maurice Sullivan. However, it is alleged in media reports that Jack Awela is in fact Peter O’Neill’s uncle. As was noted above, the NPF Commission of Inquiry argued that Awela has acted, alongside others, as a key proxy or nominee shareholder/director for Peter O’Neill, in several private companies while O’Neill headed state-owned entities, a contention O’Neill has strenuously denied. This brings to a close the first phase of O’Neill’s ascendency. The preamble to O’Neill’s career, which spans from 1987-1996 contains many of the reoccurring themes which would be observed in years to come. We see evidence of an ambitious young man, with drive, determination, and a nose for business. Also, O’Neill is a cautious entrepreneur, one who operates through a core set of close associates and confidents, ties that are cemented through close friendships and familial connections. In a competitive, cut-throat commercial world, trust and strict confidentiality are towering assets to have. 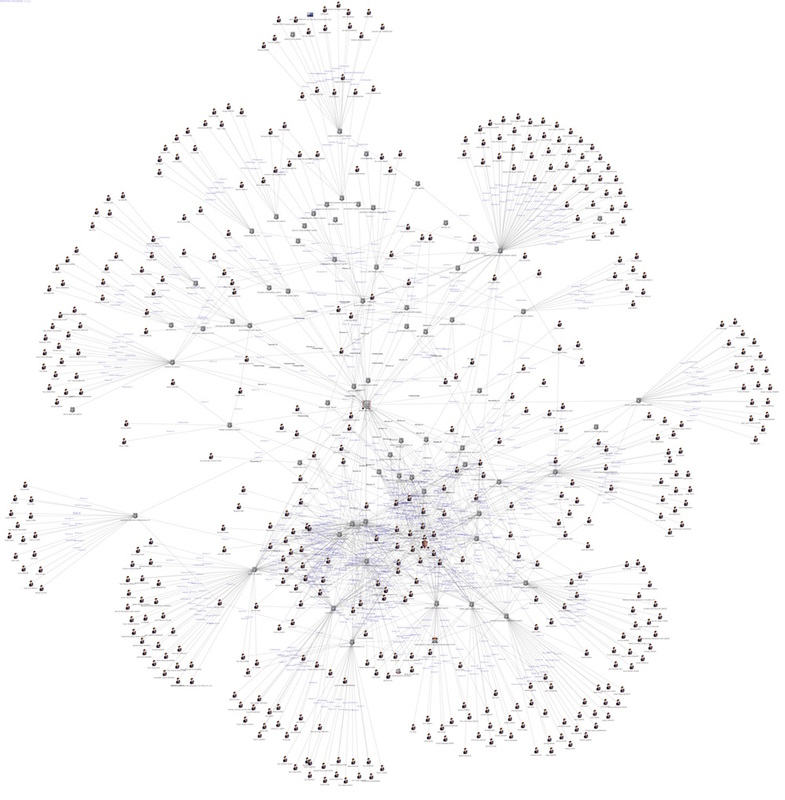 Crucially this core network acts as a loyal team. And in subsequent years, this clique O’Neill surrounded himself with in these early days, will assume managerial reigns in a range of public and private organisations. Accusations soon emerge, however, claiming this tight-knit network were acting as corporate pirates, raiding vulnerable organisations, using positions of power to loot them of their assets, for private gain, with O’Neill allegedly being one of the principal beneficiaries. One of O’Neill’s business associates and alleged first cousin, Oscar Wandi Yamuna, was another beneficiary of Skate’s appointment spree. During February 1998, Yamuna was made Managing Director of the Investment Corporation of Papua New Guinea (ICPNG). ICPNG, at the time, also acted as trustee and manager of the assets held by the Investment Corporation Fund of PNG. However, arguably the most infamous Skate appointment from this period, involved Jimmy Maladina. During January 1999, Maladina was appointed Chairman of the National Provident Fund (NPF), a compulsory pension fund for private sector employees in PNG. Peter O’Neill states that he met the Maladina family while at University but did not know Jimmy until 1994. Peter O’Neill’s alleged relative10, Nathaniel Poya, is appointed to the NPF board as a trustee, representing employers. These appointments, and the blurred line between the public responsibilities of Peter O’Neill, Jimmy Maladina and Oscar Wandi Yamuna and their private interests, would become the subject of two commissions of inquiry. The first, was NPF Commission of Inquiry led by Rtd Judge Tos Barnett which published its findings in 2002, while the second was the Commission of Inquiry into the management of the Investment Corporation of Papua New Guinea (ICPNG) and the Investment Corporation Fund of Papua New Guinea (ICFPNG), led by Judge Don Sawong, which published its results in 2007. 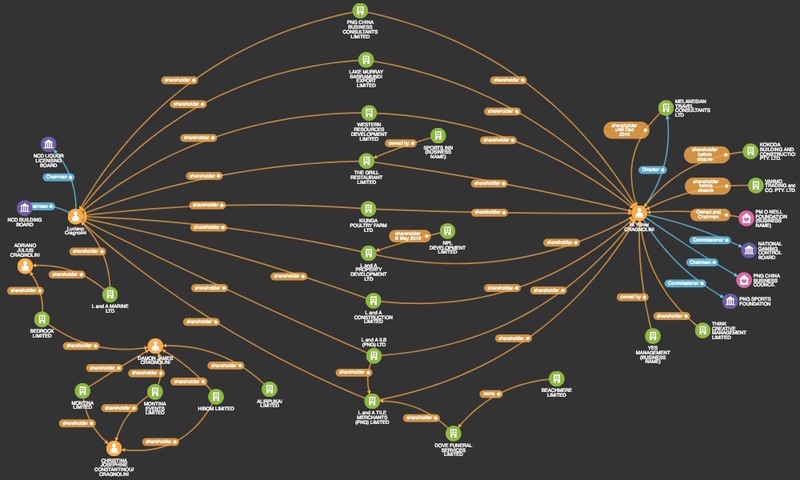 Both reports allege a vast web of corruption, fraud and malpractice, enacted through private companies connected to O’Neill, Maladina and Yamuna. A full survey of the inquiry findings will form the focus of Part II. However, to prelude that discussion, O’Neill alleged use of his public role to strengthen and grow his emerging business empire, will be summarised here. At the centre of both scandals is Port Moresby First National Real Estate Limited (PMFNRE), a successful real estate venture. PMFNRE had hundreds of clients, and a reported annual turnover in 2000 of K60 Million. Its inception as a corporate entity, syncopated closely with O’Neill and Yamuna’s rise to public prominence. The NPF inquiry observed there was a ‘clear and true and documented relationship between Mr. O’Neill and PMFNRE’. This included Peter O’Neill using PMFNRE as his banker, receiving funds for his personal benefit, borrowing large sums of money, and giving requests or directions to company staff. The Commission concluded, ‘there is overwhelming evidence that the true owner of PMFNRE is and was Mr. Peter O’Neill’ and Jack Awela, who held 90% of the shares, as a proxy or nominee for Mr O’Neill. According to the NPF Commission of Inquiry both Jimmy Maladina and Peter O’Neill benefited from the Waigani Land and NPF Tower frauds that were at the centre of the investigation. The Commission found that the proceeds, some K4.5 million, were laundered through Jimmy Maladina’s law firm, Carter Newell, and PMFNRE. PMFNRE is also said to have benefited through being awarded the ‘lucrative contract’ to manage the NPF Tower and being appointed agent for the sale of 50% of the Tower. Both appointments were allegedly made outside the lawful tender process. Further conversations were a follow up on various other project that Peter O’Neill had made to me suggesting that all the Investment Corporation properties be given to Port Moresby First, sorry, it was Hunter Real Estate at that time to manage the properties. And in that meeting, in the presence of Dr Pok he talked about the need for them to make more money enough to sustain the members they had in Parliament to remain in government. And that if I did not cooperate they would determine my future. Ruimb also implied to the inquiries, that his reluctance to award Hunter Real Estate (another O’Neill company) management contracts outside proper tendering process, led to his termination – just seven months into a three year contract – and replacement by Wandi Yamuna. Once Wandi Yamuna was appointed Managing Director of the ailing ICPNG, exclusive contracts were granted to PMFNRE for the management and sale of ICPNG and ICFPNG assets. This appointment allegedly occurred, ‘in questionable circumstances’ and ‘without following proper processes in most cases’. According to the ICPNG inquiry, Yamuna as Managing Director was directly responsible for the sale of the ICPNG’s four substantial properties. This saw PMFNRE accrue sizable commissions. Furthermore, Peter O’Neill is said to have personally benefited from the direct acquisition of at least one of these commercial properties – the Manamatana apartments, a seven-story building with 24 apartments. According to the Commission, the latter property was sold to O’Neill’s newly registered real estate company Bluehaven No. 42 Limited on ICFPNG’s behalf by PMFNRE, who received an inflated fee of 3.5%. The sale price was K2 million. The ICPNG inquiry found the sale was made at K245,000 less than the latest valuation with no transparent bidding process. The Commission of Inquiry also concluded the sale was negligently approved by the then two Ministers in charge, Fabian Pok and Iairo Lasaro – it will be recalled Pok was alleged to have pressured Yamuna’s predecessor to improperly appoint PMFNRE. O’Neill testified that his wife personally received K40,000 from the sale by way of commission, paid by her employer PMFNRE. In July 1998, PMFNRE received a PNGBC loan of at least K146,231. It was claimed by the NPF Commission of Inquiry that O’Neill is the true owner of this company [see references above]. During May 1999, South Super Stores registers a PNGBC loan worth 4 million Kina. By his own admission O’Neill still owned shares in the company (formerly known as Mecca No.36) and was trying to find a buyer for it at this time. Nama Coffee Export – a coffee export company as its name indicates, with shares owned by Jack Awela and Ken Fairweather among others, but which O’Neill testified in the NPF inquiry he actually owned – received a 4 Million kina PNGBC loan in March 1999. Bluehaven No. 41 Limited, a merchant and retail company freshly incorporated in June 1999 and owned by O’Neill, was given a loan facility worth K341,000 in July 1999. In his evidence to the Commission of Inquiry O’Neill claims these were all legitimate business loans, approved through the normal bank processes and that he played no part in the approvals, despite being Executive Chairman. 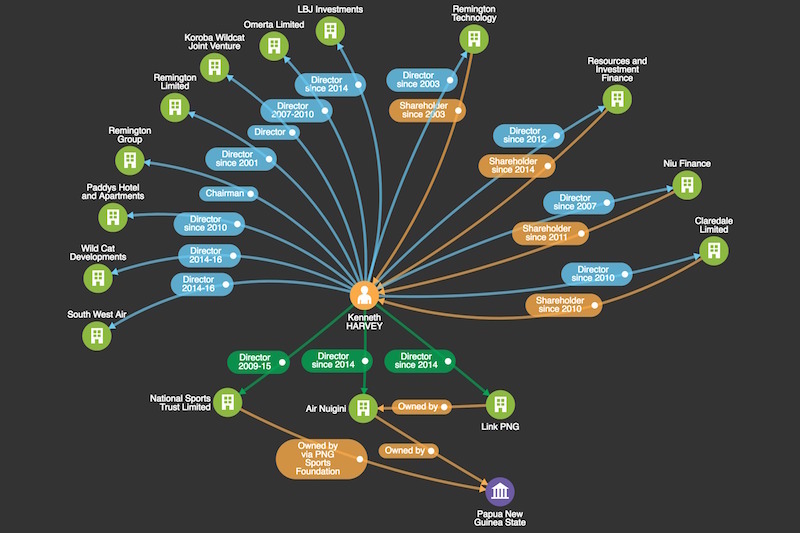 O’Neill’s role as head of numerous state companies also landed him hefty directorship fees. Following his dismissal from PNGBC, for example, O’Neill received K1,390,000 in ‘final entitlements,’ from that one company alone. Under Skate’s tutelage, 1998-1999 represented a watershed moment for Peter O’Neill. In less than 24 months he was appointed to senior positions in 25 state entities, while close affiliates found themselves in command of the ICPNG and NPF. According to Judges, Don Sawong and Tos Barnett, who led the two commissions of inquiry, executive power was used to rig market transactions, so illegitimate benefits could be distributed to O’Neill and his network of conspirators. Tos Barnett, in particular, alleges the proceeds of these illegal activities was laundered, and then used to acquire assets, such as Resource & Investment Finance Limited. In addition to this, IPA records suggest millions in PNGBC funds were loaned to O’Neill entities, while he was Executive Chairman. While the veracity of all these allegations levelled by the two former National and Supreme Court judges, can not be verified here – nevertheless, it is certainly apparent O’Neill soon went from a modest businessman, to one of Papua New Guinea’s first oligarchs. And on this strong foundation, a promising political career was launched. Pangia Enterprises Limited, Historical directorship, IPA. Oscar Wandi Yamuna kept a directorship in Pangia Enterprises until its 2010 merger with several of Peter O’Neill’s companies into Paddy’s Hotels & Apartments Limited. Pratley & O’Neill, Business Name Extract, IPA. The filing of an application for the registration of the business name was lodged the day of the cessation of the activity, on 21 August 1993. Hunter Real Estate Limited, Company Extract, IPA; Hunter Real Estate Limited, Annual Return 1998, IPA. From the public records it is impossible to tell if Peter O’Neill acquired/ purchased the shares or started the business himself because there are no records between 1992-1996. The business was incorporated in 1992. South Super Stores Limited, Company Extract, Investment Promotion Authority; South Super Stores Limited, Historical directorship, IPA as shown on 06/03/2017; South Super Stores Limited, Historical secretary positions, IPA as shown on 06/03/2017 ; South Super Stores Limited, Notice of Change of Shareholder, IPA; South Super Stores Limited, Annual Return 1997, IPA. The annual return indicates that SSS started trading in January 1992. The ownership of South Super Store itself has been the subject of much controversy detailed in the National Provident Fund Commission of Inquiry. Barnet, T. (2001), Commission of Inquiry into the National Provident Fund, Transcript of Proceedings, 27 November 2001 at pages 18,24 and 32. Barnet, T. (2001), Commission of Inquiry into the National Provident Fund Transcript of Proceedings, 27 November 2001, at p14. Standish, B. (1999), Papua New Guinea 1999: Crisis of Governance – Parliament of Australia. (Accessed 6 Mar. 2017). Barnet, T. (2001), Commission of Inquiry into the National Provident Fund, Transcript 10 May 2001 at p22. “In essence, the commission has found that the money was “laundered” through the books of account of Carter Newell Lawyers and PMFNRE. “Further investigation of this fraud and other suspicious activities are reported upon in Schedule 6 which also relates the full history of the frauds perpetrated by Jimmy Maladina, Herman Leahy and Angelina Sariman in early 1999 whereby they illegally obtained K2.5 million from NPF and attempted to benefit from a K2 million commission to Port Moresby First National Real Estate (PMFNRE). It also reports upon the involvement of Peter O’Neill, Maurice Sullivan and Ken Barker. 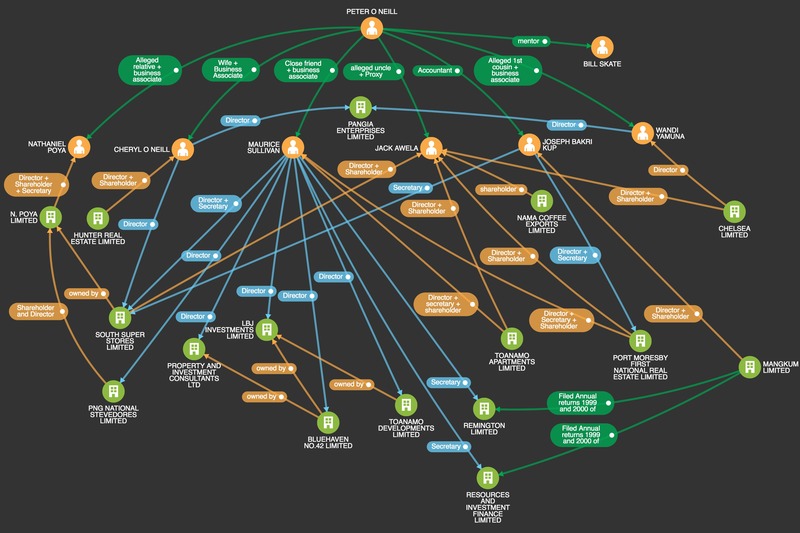 Schedule 6 presents the results of the commission’s investigation into the money trail, which traced the “dirty money”, as far as possible to its eventual recipients. 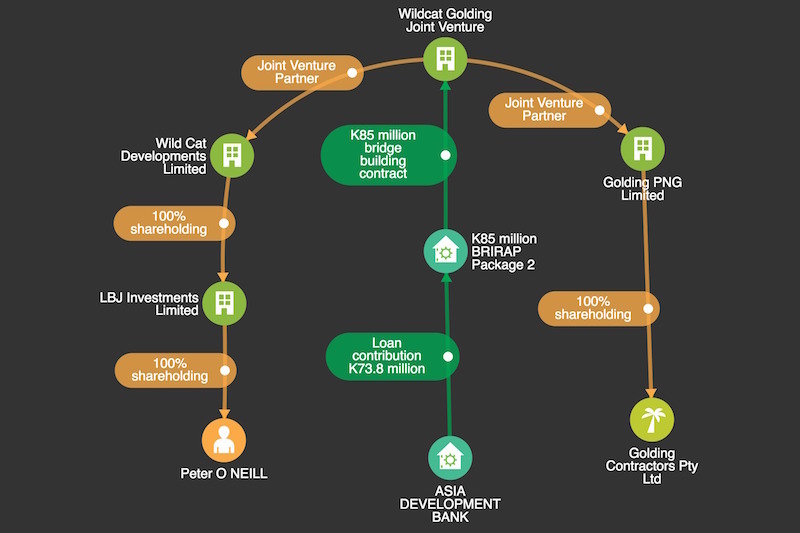 The trail leads through the bank accounts of Carter Newell Lawyers and PMFNRE to the intended beneficiaries who include Mr Maladina, Mr Leahy and Ms Sariman as well as the directors of PMFNRE Ken Barker and Maurice Sullivan and Peter O’Neill, executive chairman of the PNGBC and Finance Pacific and the secret “owner” of PMFNRE” p77 of the Commission of Inquiry into the National Provident Fund. Sawong, D. (2007) Ibid. p122, 124 and 125. Barnet, T. (2001), Commission of Inquiry into the National Provident Fund, Transcript of Proceedings, 27 November 2001 at ‘Transcript 9105’. Bluehaven No. 41 Ltd, Notice of Change of Shareholder, Investment Promotion Authority, 25 June 1999. Transfer occurs 21 June 1999 to Peter O’Neill and Lynda Babao. From 1999 until 2007, O’Neill expands a business empire, established during the preceding decade under controversial circumstances. Notably O’Neill establishes commercial ties with an elite strata of international businessmen and lawyers, along with a number of notable local heavyweights of politics and business. In effect O’Neill becomes a man with formidable commercial, legal and political connections – which he uses to grow his commercial and political empire. Critically, between 1999 and 2001, O’Neill invests over two million kina in LBJ Investments Limited, a company named after three of his children (Loris, Brian and Joanne). It has become the main holding company for many of his businesses. To this day, LBJ Investments sits at the centre of O’Neill’s business empire. We know the lawyer Gregory James Lay, set up LBJ on behalf of Peter O’Neill and held the shares as a trustee for O’Neill’s children until at least December 1999. Lay later went on to serve as a National Court judge from 2004-2009 and also served, in 2015, as the chair of a committee looking into the appointment of a new Chief Ombudsman. Australians Maurice Sullivan and James Dawson, the latter worked under O’Neill at the PNG Banking Corporation, and more recently Kenneth Harvey and John Beattie, have all served as LBJ directors. Harvey and Beattie are also involved in O’Neill’s Remington group (see below), as directors and, in Harvey’s case, through a minority shareholding. Outside of this, Harvey currently sits on the board of Air Nuigini and its subsidiary Link PNG, while Beattie has been a partner in the Pacific Legal Group since 2000 and is involved in many companies linked to the construction and mineral industries. Jimmy Maladina, who owns 30% of the company, through Ferragamo Limited. Australian/Pakistani businessman Mohammed Sultan and Indian executive, Sanjay Shah, who initially own 39% of Omerta through their company Supreme Industries Limited and Amender Ltd, a company they acquired from Jimmy Maladina in August 2000. The Australian James Kenneth Dawson, who serves as a director of Omerta from 2000 – 2006. 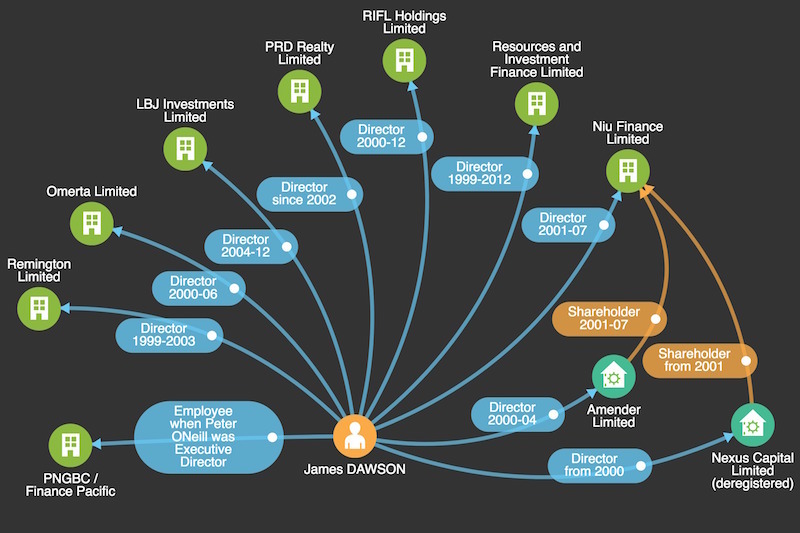 Dawson is also a director of Resources & Investment Finance Limited from 1999 – 2012. Via Omerta, Peter O’Neill further diversifies his business interest, with the acquisition of the IT company Remington Limited, from an Australian concern, Baradeen Holdings Pty Ltd. In 2003 we also know that all the shares in a separate company, Remington Technology Limited, of which Remington Limited owned 50%, were transferred to LBJ Investments. Today, Remington Technology is one of Peter O’Neill’s biggest and most valuable companies, with declared assets of over K58 million. O’Neill owns over 92% of the shares and Kenneth Harvey a little under 8%. An industry magazine observes, Remington Group ‘provides PNG businesses, governments and AID organisations with business services, document solutions, printing, business equipment and after-sales support’. According to the CEO of one Australian partner firm, FileBound Australia, the Remington Group ‘have tremendous relationships with corporate and government organisations’ in Papua New Guinea. Nexus Capital Limited, a company linked to James Kenneth Dawson, as director from 2000 until 2006. NIU Finance share records reveal fluctuations in company ownership and control over the years. As of May 2017, O’Neill owns 78% of the company, while the political identities, Michael Nali and Ken Fairweather own 10% each, through Kwadi Inn and Piskulic Limited, respectively. As O’Neill expanded his network of business interests during 2000 and 2001, the NPF Commission of Inquiry, conducted its hearings. The inquiry concluded in 2002, the same year that Peter O’Neill is elected to Parliament for the first time as the member of Ialibu-Pangia. Minister for Public Service from August 2003 to May 2004. O’Neill is then dumped from government after he led an unsuccessful bid to oust Somare, with Moses Maladina (one of Jimmy Maladina’s brothers, Jimmy’s other brother, Harvey, is a partner in the law firm, Young & Williams, alongside the Australian, Greg Sheppard, who has acted for O’Neill over many years). O’Neill became leader of the opposition for the remainder of the government’s term. O’Neill’s career suffered further political turbulence during August 2005, when he was charged with seven counts of misappropriation and one count of conspiracy relating to his earlier involvement in the NPF scandal. In spite of the evidence collated by the Commission of Inquiry, the charges against O’Neill were dismissed by magistrate Mekeo Gauli at the committal hearing in January 2006. He upheld a submission of no case to answer made by O’Neill’s then lawyer Rimbink Pato. Pato currently serves as the Minister for Foreign Affairs and Immigration in the O’Neill government. Previously he succeeded O’Neill as Executive Chairman on the PNGBC board and at Finance Pacific. O’Neill was successfully re-elected in 2007, becoming Minister for Public Service under a coalition government again led by Michael Somare. It is at this juncture that some new and important actors enter O’Neill’s business circle. LBJ Investments Limited, Notices of issue of shares, Investment Promotion Authority, 4 June 2004; LBJ Investments Limited, Notice of issue of shares, Investment Promotion Authority, 11 August 2004. Beattie and Harvey are directors of Remington Technology Limited and Harvey is a minority shareholder with 13% of the shares. Harvey is also, since 2001, a director in Remington Limited since 2001. Omerta Limited, Notice of issues of shares, Investment Promotion Authority, 24 February 2000. Although, the ownership details in official IPA records appear not to have been updated – Remington Limited is still listed as being owned by Baradeen Holdings by the IPA. Remington’s 1999 annual return held by the IPA indicates an upcoming sale to Omerta. Furthermore, Peter O’Neill told the NPF Commission of inquiry [See variously in the Commission of Inquiry into the National Provident Fund, Transcripts of Proceedings, 18 October 2001 at page 17, page 315 and page 316 and Peter O’Neill’s statement of 10 May 2001 (point 40 on p24) and the transcript for 27 November 2001 – O’Neill’s statement at p 49.] that he had acquired the company, although in his testimony O’Neill said it was through LBJ, not Omerta, for K200,000. Baradeen Holdings Pty Ltd. Current & Historical extract, Australian Securities & Investment Commission, accessed on 1 November 2016. Remington Technology Limited, Annual Return 1999, Investment Promotion Authority; Remington Technology Limited, Notice of change of shareholder (share transfer), Investment Promotion Authority, 30 November 2005. In 2001, Peter O’Neill told the National Provident Fund Commission of Inquiry “LBJ is a company formed in late 2000 to hold a number of investments on behalf of my children Loris, Brian and Jo-Anne. Mr Gregory James Lay formerly of Young and Williams Lawyers now Norton White Lawyers incorporated the company and held its shares in trust for my children” [paragraph 41 of O’Neill’s affidavit given in evidence on 10 May 2001] But according to documents filed with the IPA Peter O’Neill himself purchased the single share in LBJ from Lay in December 1999. PNGBC Ltd, Notice of change of directors and particulars of directors, Investment Promotion Authority, 26 January 2000. National Provident Fund Commission of Inquiry at Page 84 and page 85 and Transcript for 4 February 2002 at page 6. While a Minister, in September 2008, Peter O’Neill become director and minority (10%) shareholder in the company PNG China Business Consultants Limited, alongside the prominent couple, Australian Luciano Cragnolini and his Chinese wife Ni Yumei Cragnolini. 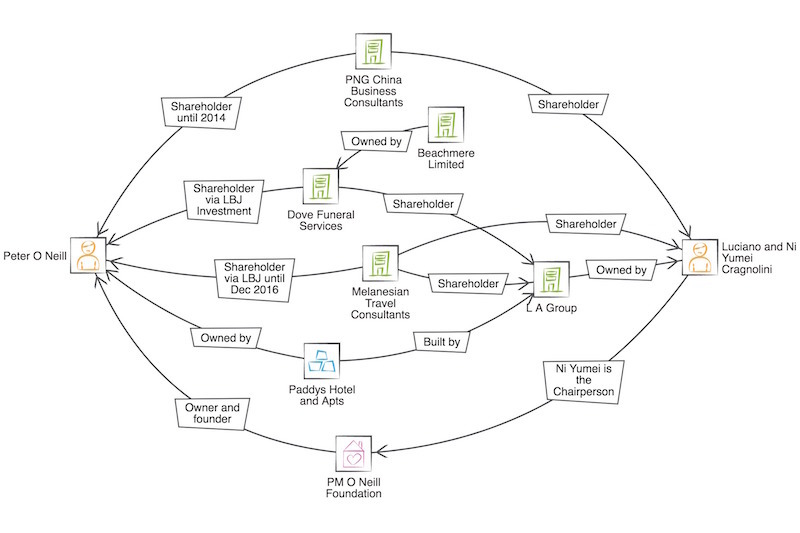 When O’Neill originally joined PNG China Business Consultants Limited, the majority of shares (80%) were held by Hong-Kong resident, Sing Yun Lin, and Ni Yumei Cragnolini (10%); the company’s declared activities are consulting and wholesale trade. In 2014, both O’Neill and Sing Yun Lin transferred their shares to the Cragnolini’s, leaving them with sole ownership. However, the registry of foreign enterprises still lists Peter O’Neill as a shareholder. Luciano Cragnolini has earned a colourful reputation in PNG, and has extensive business interests. During November 1995, he was dubbed “Dirty Larry” by the Australian media. The Sun Herald described him as a hero for ‘shooting down a gang of 11 robbers’ in a Clint Eastwood style stand-off in a PNG restaurant, killing two of them and critically wounding two others with his .38 semi-automatic pistol. Years later, in May 2008, Luciano’s right-hand man at his company L&A Construction was murdered outside the company offices. Chairman of the National Capital District Liquor Licensing Board. Commissioner for the PNG Sports Foundation. Chair of the PNG China Business Council. Ni Yumei has also acted as the Chair of the PM O’Neill Foundation, and is the joint owner of the PM O’Neill Foundation business name. The Cragnolini’s business association with Peter O’Neill strengthened further in May 2009, when O’Neill’s LBJ Investments and L&A Tile Merchants (PNG) Limited each acquired a 45% stake in the funeral company, Dove Funeral Services. L&A Tile Merchants is part of the Cragnolini group of companies. Three-years later O’Neill and the Cragnolini’s acquire full ownership of the company, after they acquire the final 10% of the shares from Australian, Kevin Bender. In February 2010, a new O’Neill company is registered, Claredale Limited. LBJ and Remington Technology are the owners, each holding 50% of the shares. During July 2010, Peter O’Neill’s political career also gets a boost when he is appointed Finance and Treasury Minister, in addition to his role as Minister for the Public Service. Following his political promotion, in September there are further additions to O’Neill’s business empire and growing links to the Cragnolinis. First, is the acquisition by Remington Technologies of a 34% stake in yet another Cragnolini company, Melanesian Travel Consultants Ltd. The Cragnolini’s had purchased the company just three months earlier. Remington did not maintain its shareholding for long. Just 6 days later it transfers them to another O’Neill vehicle, LBJ Investments. Together they form Paddy’s Hotels & Apartments Limited. The company’s main asset is the Paddy’s Hotel, Shamrock pub and Reef ‘n Beef restaurant complex in the Port Moresby suburb of Boroko, built for O’Neill by the Cragnolini’s L&A Construction Ltd. The hotel was opened in September 2012. While the Paddy’s hotel complex was under construction, Peter O’Neill took the Prime Ministership in August 2011. This followed complex political maneuvers which toppled the acting Prime Minister Sam Abal, while Michael Somare was away for medical treatment in Singapore. The ousting of Somare was later ruled unlawful by the courts. This precipitated an enduring constitutional crisis. It was finally settled after O’Neill was re-elected Prime Minister by Parliament in August 2012, after a national election. As Prime Minister, O’Neill became a shareholder in a range of state enterprises and entities. For instance, he is made one of three shareholders in the National Airports Corporation Ltd (NAC) from 2012 until 2015. Peter O’Neill is also appointed, in August 2012, sole shareholder of the newly created Kumul Minerals Holdings Limited (KHM), an umbrella entity in charge of all the state’s minerals assets (the successor of Petromin). Kumul Minerals Holdings is parent to a range of state subsidiaries. In October 2016, O’Neill announced the appointment of Peter Taylor as KMH’s Chairman. Taylor has served as Managing Director for Ok Tedi and ExxonMobil. O’Neill’s ascent into the highest political office, did not place a brake on his business interests. Both bloomed, often in symbiotic ways. For example, O’Neill patronized his own businesses in March 2012, when he opened, as Prime Minister, ‘state-of-the-art’ premises for Dove Funeral Services. While the Prime Minister is reported to have congratulated L&A for their success, he remained circumspect about his own stake in the business. During May 2012, the O’Neill-Cragnolini funeral company, acquires Beachmere Limited, from the prominent lawyer, New Zealander, Jeffery Shepherd. It is unclear what the nature of Beachmere’s business is. More details exists, however, on O’Neill’s next investment. In January 2014, LBJ Investments acquired Wild Cat Developments Limited (previously Carson Pratt Services and, in October 2016, briefly renamed Construction and Procurement Services Limited and now TGC Limited). Wild Cat (now TGC) is described as the ‘leading mineral and petroleum exploration and support company in the PNG highlands’. Following its acquisition by LBJ Investments, the company enjoyed considerable success. During 2016 the company explained its significant expansion during the preceding year, which occurred it would appear on the back of major government contracts. This dependence on government contracts, the company’s CEO claims, has in fact created serious challenges: ‘…A great deal of our civil infrastructure work has been with the Government and their reduced revenue makes it difficult to: one, get paid for work completed; and two, continue working on Government-funded work in the absence of any guarantee of getting paid’. He adds, ‘to attempt to counter this, Wild Cat Developments is pursuing work that is not directly or completely funded by the Government; for example, ADB, JICA or World Bank funded projects and/or privately funded projects’. A few months after the Wild Cat Development deal, LBJ acquired a Wild Cat sister company, the airline South West Air, through Remington Limited. South West Air is a ‘charter aviation company providing both fixed wing aircrafts and rotary wing services across Papua New Guinea’. The Wildcat Golding Joint Venture  registered in December 2014. It is a partnership with Golding PNG Limited, a subsidiary of the Australian company Golding Pty Limited ‘one of Queensland’s largest privately owned civil infrastructure and mining services company’, according to their website. The formation of the Wildcat Golding Joint Venture (JV) saw the company awarded at least one major construction contract. In December 2014, it was awarded a K84.5 million contract to construct bridges in West New Britain. The contract was almost completely funded by the Asian Development Bank. Last, but not least, is LBJ Investments’ acquisition of 407,000 shares in the insurance brokers Insurance Partners (PNG) Limited, during June 2014, giving O’Neill a 37% stake in the business. LBJ purchased its shares from Barry and Jason Tan. Additionally, O’Neill’s accountant, Joseph Kup, owns 16% of the shares in the company, which he acquired in 2004, giving the two a controlling interest. According to its annual return for 2015 Insurance Partners has 20 employees, gross assets of over K20 million and net assets of about K3.5 million. In both 2014 and 2015 the company made an operating profit of around K2.5 million. According to market analysts, Oxford Business, Insurance Partners is a firm known for ‘specialising in government business’. Selling off some jewels from the crown? Towards the end of 2016, nine moths out from a national election, we see the first ever apparent contraction in O’Neill’s business empire. In this period Peter O’Neill sold off a number of his more recent acquisitions to a company called Iaraguma Limited. Iaraguma is owned by Theophilus George Constantinou. Constantinou is a descendent of one of PNG’s wealthiest and most influential migrant families, whose fortune has been made over a period of decades, in PNG’s building, construction and hospitality industries, with interests also in Queensland and the Solomon Islands. The Panama Paper investigation, also revealed that Constantinou is linked to a company incorporated in the British Virgin Islands, a jurisdiction famed for its opaqueness. The businesses sold to Constantinou have declared net assets of over K22 million, although much of the financial information is seriously outdated and net assets do not normally reflect the true or full value of a business. The companies sold include, Insurance Partners Limited, Wild Cat Developments (since renamed) and Southwest Air. In December 2016, O’Neill also sold his interest in Melanesian Travel Consultants to the Chinese national, Yuewei Ni. L&A Group of Companies company website, ibid. Melanesian Travel Consultants, Company Extracts, Investment Promotion Authority and share transfer documents. Callick, R. (2011), ‘PNG vote weakens link to Michael Somare era,’ The Australian, August 3.
 http://www.smh.com.au/world/oneill-elected-png-prime-minister-20120803-23kjr.html accessed on 31 May 2017. Wrakuale, Ancilla. (2012) ‘Modern funeral service opens in city’, The National, 30 March 2012. The ADB financed over $28M of the $32M contract. Insurance Partners (PNG) Limited, Particulars of Notice of change of shareholder (share transfer), Investment promotion Authority. Gray, S (2008), ‘murdered businessman buried in Brisbane’ Sydney Morning Herald (accessed 7 March 2017). 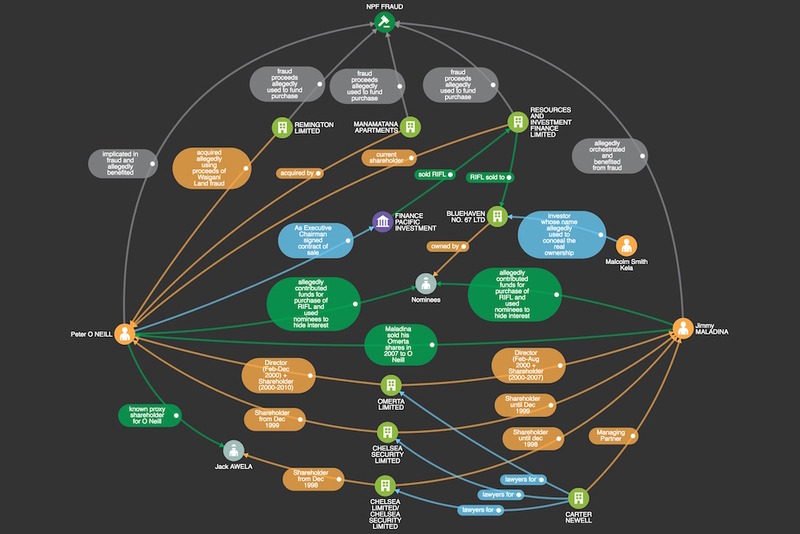 International Consortium of Investigative Journalists, Offshore Leaks Database, Panama Papers (accessed 6 March 2017). The Panama papers revealed the registration of a company called Allenbridge International Limited incorporated in the British Virgin islands with an address in Hong Kong, and with the other known PNG businessman, David Hunter Cox as another shareholder alongside Theophilus Constantinou. Arguably, Peter O’Neill is Papua New Guinea’s most successful politician and businessmen. While climbing the political ranks, he has amassed a fortune that spans a vast range of sectors. O’Neill is not the first leader to excel in politics and business. The 20th century has produced notable examples. Italy had Silvio Berlusconi, the United States, Donald Trump, the Philippines, the Marcos family, and in neighbouring Indonesia, there is the vast fortune commanded by the Suharto family. As each example hints, juggling political and economic power, is fraught with dangers and tensions. O’Neill felt the turbulence first hand, when his initial taste of public and private power, came under the spotlight of two commissions of inquiry. Since then, these potential tensions between his public mandate and private interests, have only increased in number, as O’Neill commands a business empire that has benefited from lucrative contracts given out by the Government of Papua New Guinea. There is no evidence on the public record to suggest these contracts involve the improper use of power. At the same time, given O’Neill’s alleged use of proxy shareholders, it is seemingly impossible to properly scrutinize his conduct. And that is to assume there was an agency capable of conducting a credible investigation. The enduring risks posed by this close fusion of political and economic power, for a transparent democracy, will become apparent as we delve deeper into the O’Neill empire in Parts II and III of The Midas Touch.